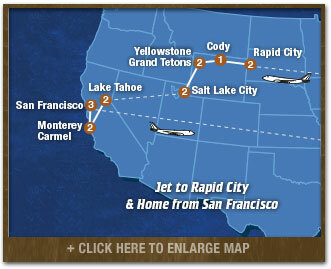 Jet to RAPID CITY...a great start to your summer! BLACK HILLS OF SOUTH DAKOTA…A fun stop at Wall Drug (get your ice water! ), before you explore the moon-like terrain of Badlands National Park. You'll be in awe of the incredible Mount Rushmore Night Lighting Ceremony, with a Sound and Light Show that will rock you! CODY…Get a taste of true western life at the world famous Cody Stampede Rodeo! Meet cowboys, cowgirls, rodeo entertainers, clowns and more! YELLOWSTONE NATIONAL PARK… The first of our nation's great parks…You'll be blown away by Old Faithful's on time performance, and by the steamy Hot Pots and Mud Flats along Geyser Trail. GRAND TETON NATIONAL PARK… Jenny Lake's beauty will take your breath away, but save some breath for your hike to Hidden Falls and Inspiration Point. Get your camera ready for snaps of moose and elk in Cascade Canyon - they're all over the place! SALT LAKE CITY… Park City Resort Action Center… We'll get professionally guided Mountain Biking instruction at the base of the Wasatch Range before we head out on the trails. Take the Ski Lift to the top of the mountain, then choose your way down…control your own speed on the Giant Alpine Slide, or fly down the incredible ZipRider, one of the world's longest zip lines! Jet to LAKE TAHOE… Spectacular Lakefront Resort…It's condo-living for you and your friends…cook up your own breakfast and dinner. Try Water Skiing, with professional instruction, or tubing, kneeboarding, wakeboarding, stand-up paddleboarding, kayaking on this fabulous lake. Relax on the beach, play beach volleyball, swim the beautiful blue waters. At night it's Magic Carpet Mini Golf. WHITEWATER RAFT TRIP… Shoot the rapids on a great professionally-guided rafting adventure on the American River. This leads up to one of the most exciting and fun-filled stops on your trip. MONTEREY/CARMEL… See amazing undersea life at the fabulous Monterey Bay Aquarium Visit the Original Cannery Row and Fisherman's Wharf. Take the Seventeen Mile Drive on the Pacific Coast Highway to Seal Rock and the Lone Cypress, then play beach football or just relax on the white sand of this world famous California resort area. 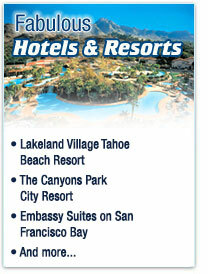 SAN FRANCISCO… We'll check in to the beautiful Embassy Suites on San Francisco Bay. Walk down Lombard Street, the world's crookedest, grab a bite at Pier 39 or Fisherman's Wharf, then dessert at Ghirardelli Square. We'll take in a Giants' or A's night baseball game. 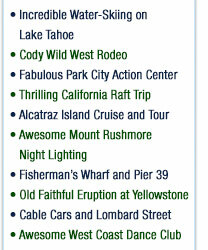 Have dinner at the Hard Rock Café and take a Night Cruise and Tour of Alcatraz Island ($36 value). Walk across the Golden Gate Bridge to explore the charming Sausalito waterfront, take a cable car to a Chinatown banquet, and a night of dancing at our cool West Coast Dance Club! Next day we pack our bags and fly home with great memories and new found friends!